La Pointe is located within Canada’s Poisson Blanc Regional Park, and it’s a nature-loving minimalist’s dream come true. The micro home gets its name from the distinctive triangular geometry that comes to a cathedral-style point in the roof. 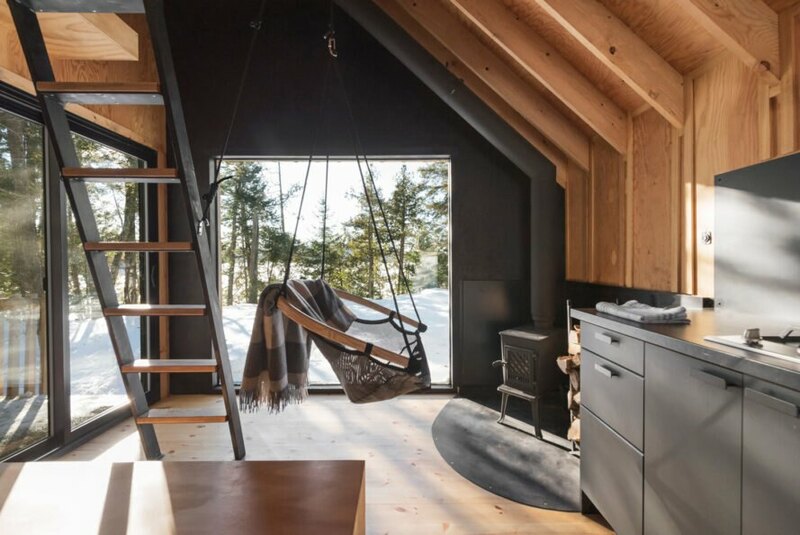 The designers at Atelier L’abri wanted to honor the A-frame style that was made popular in North America in the 1950s while still providing the essential functions needed in a forest cabin. La Pointe offers off-the-grid living that isn’t completely isolated from civilization. The micro home is located off of a nature trail about 10 minutes by foot from the park’s reception pavilion. 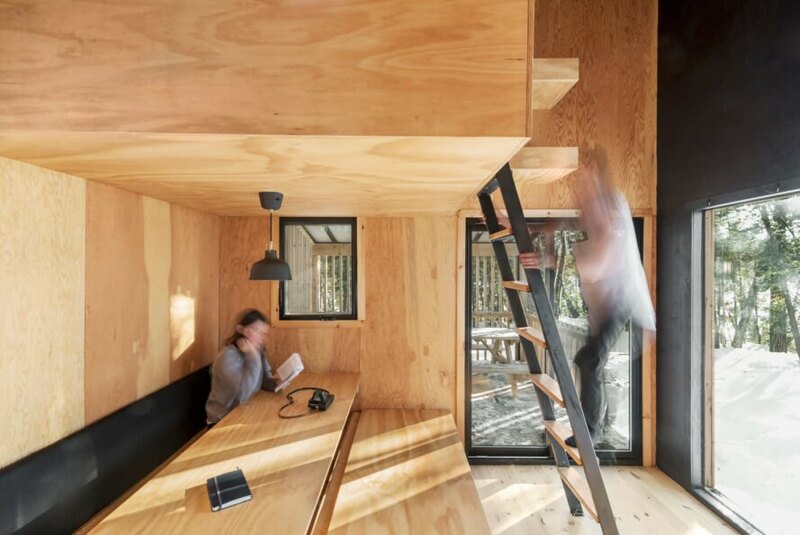 Despite the minimal square footage, there is room for up to four occupants inside thanks to the first-floor table’s ability to convert into an extra bed. The structure was built on-site and features a kitchenette, an outdoor porch area and a lofted bedroom accessible by ladder. The bed is suspended mezzanine-style using steel rods, and it calmly overlooks the rest of the home. The entire space, including the sleeping area, takes full advantage of the natural light that streams in during the day. The connecting covered terrace is the perfect spot to enjoy the space when the weather is hot, and the wood-burning stove keeps the house warm in the cold Canadian winters. The whole structure is raised off the ground to prevent weather-related damage from both the snow and the nearby reservoir. The exterior, made from natural cedar boards, creates a woodsy look that blends in beautifully to the surrounding forest landscape. The roof is made from steel, a recycle-friendly option for a building material. The interior uses the same cedar, which — combined with the dark, steel-colored appliances inside — creates an organic and raw look. Occupants can enjoy the forest views from the large bay window that centers the home from the first floor. 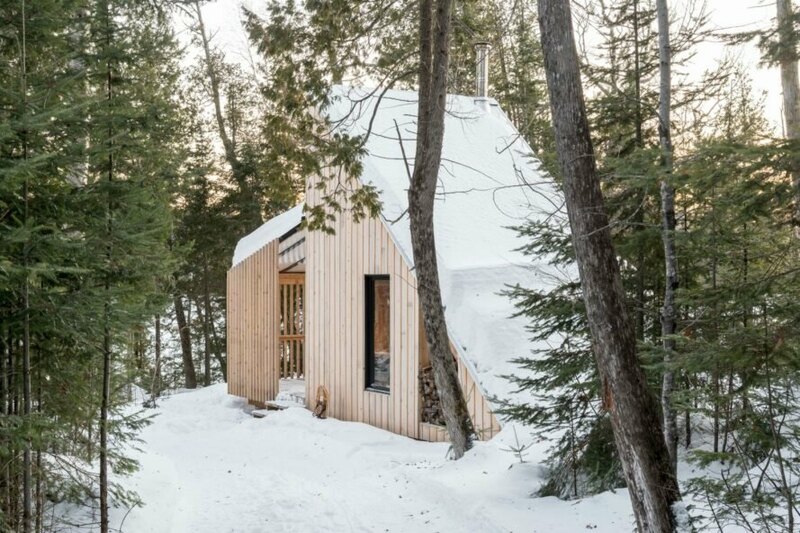 Atelier L'abri designed this charming micro home in Canada's Poisson Blanc Regional Park. 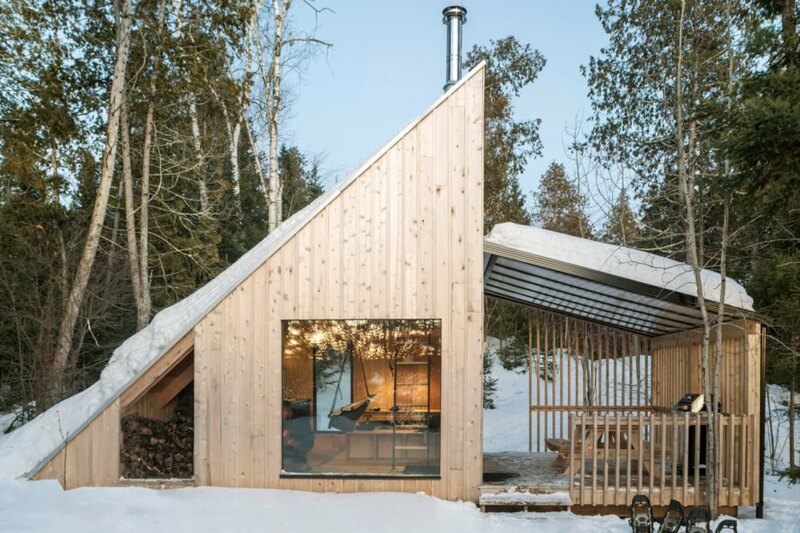 The cabin's sloped roof pays tribute to the ever-popular A-frame cabins of North America. Minimalist interiors allow the occupants to relax and enjoy the pristine surroundings. The cabin is simple but includes all of the essentials. 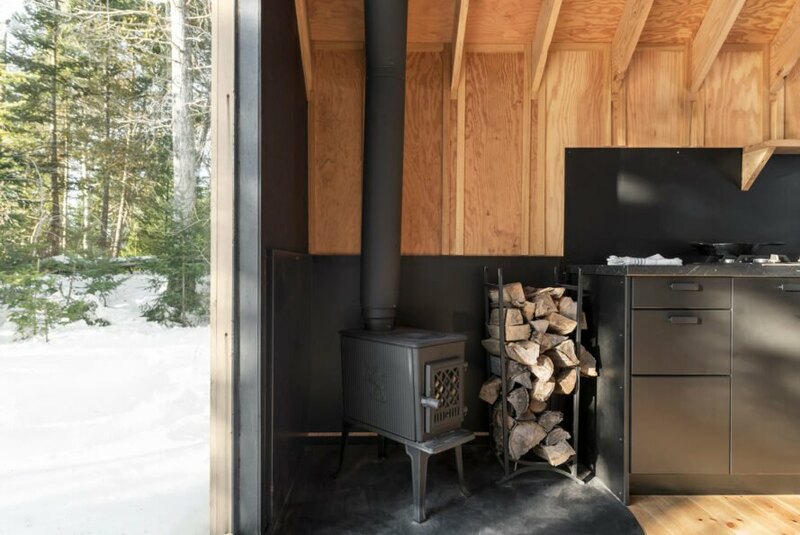 A wood-burning stove keeps the micro home toasty during the frosty Canadian winters. Natural cedar boards inside and out blend the cabin into its surroundings. The micro home allows its residents to go off the grid while still remaining somewhat close to civilization.